Are you familiar with the following scenario? You stumble into the living room in the morning on your way to the kitchen for coffee, and you see it: a brand new, Wolverine-worthy set of claw marks down the entire side of your couch. While you slept, your feline bundle of fur and energy added more scratch marks to your sofa. Your fussy Aunt Gertrude is coming for a visit in two weeks, your new sofa is arriving in seven days, and you need to make sure that your cat doesn't give your aunt another reason to scold your housekeeping abilities. How can you teach your cat to stop scratching your couch in just seven days? To stretch. Scratching provides exercise and valuable stretching for the muscles and tendons in a cat's body from her toes to her neck and shoulders. To mark. A cat's paws contain scent glands and scratching things releases odors that mark her territory. It's important to feline social structures to use this method of communication. Even if you only have one cat in your household, she will feel the need to transmit information in this manner. To maintain claw health. Scratching helps a cat shed the outside nail husk periodically as needed, to keep the claw healthy. To feel good. Scratching just feels great to cats. It relieves stress and decreases the possibility that your cat will develop other unwanted behaviors. Now that you know why scratching is important to cats, you might wonder if it would be best just to have your cat declawed, so you don't have to worry about ruined furniture. It's important to understand that declawing a cat is an amputation of the digits up to the first joint. It's painful, fraught with possible complications during and after surgery, and changes the way your cat walks, balances, and interacts with her world. You can learn more about why declawing is considered inhumane by many people, is banned in several countries, and may be made illegal in some US cities soon in this article: "Declawing Cats: Banning Declaw Surgeries." The good news is that you absolutely can get your cat to stop scratching your sofa. In time for Aunt Gertrude's visit, too. Follow the easy steps below to save your new couch from suffering the same fate as your old one. 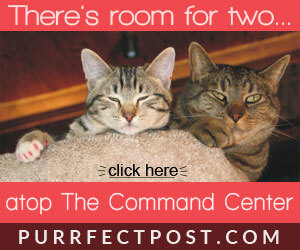 Day 1: Decide on, locate, and purchase several cat scratching posts and some interactive cat toys. This is a critical step in the process. It is essential that you choose the right kind of post because providing your cat with a scratching surface that she doesn't like isn't going to work. 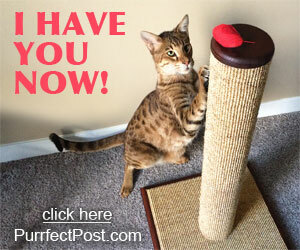 Make sure that you choose a post that is strong, sturdy, tall, and covered in a material that cats love to scratch. 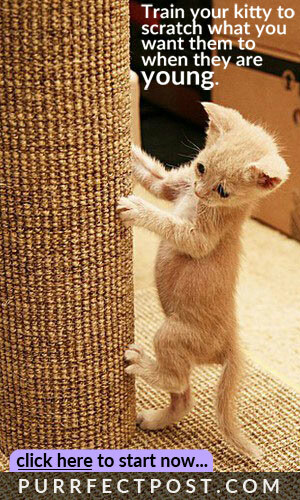 Learn more about choosing a great cat scratching post in this article: "How to Choose the Best Cat Scratching Post." 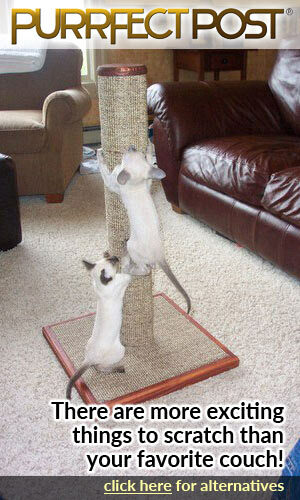 Day 2: Place the cat scratching posts strategically around your home. Choose places that your cat already likes to hang out, such as near windows and in the family room with you. Cats also love to stretch and scratch when they first wake up from a catnap, so placing a post near her regular sleeping area is a good idea. Cats scratch partly to mark territory, so don't tuck the post away in an unused corner. Place it front-and-center so she can show off. It's also important to place a post in front of the area of the couch that your cat is scratching. When you see your cat investigating the new posts, give her quiet praise and a cat treat if she likes them. 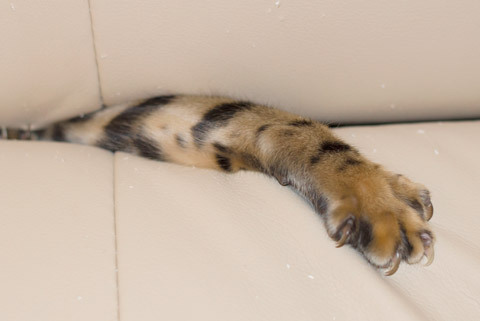 Tuck a sheet around the scratched area of the couch tightly so your cat can't get under it to scratch the couch. Use double-sided tape or aluminum foil on the couch. Spray the couch with a citrus-scented spray because cats have a natural aversion to citrus odors. Day 4: Get your cat interested in the scratching posts by sprinkling them with catnip or spraying them with honeysuckle. Learn more about catnip and honeysuckle. Day 5: Get your cat even more interested in the post(s) by using a wand toy. Start by playing with the wand toy a few feet away from the post. Once your cat is playing along, sweep the toy so that its end drapes over the post. Often, when cats "discover" their post this way, especially when it's covered in a great scratch-worthy material like sisal fabric, they will come back to it again and again. Day 6: By this point, your cat should not be trying to scratch your sofa anymore, but if she is, consider adding the product Feliway to your anti-scratching arsenal. Feliway is a product that mimics the feline facial pheromone that makes cats feel calmer. If your cat is scratching your couch because she is feeling stressed, Feliway can help. Spray the sofa and any areas that your cat normally hangs out. Continue to play with your cat near the scratching post, and reward her with praise and treats when she uses it. Day 7: Enjoy your new couch, and get ready for Aunt Gertrude's visit. Your cat should now be using her scratching post instead of your couch. When your new couch arrives, you may need to make it unattractive to her for a few days to a week, so she immediately knows that it isn't a place for scratching. Use whatever method worked to keep her from scratching the old couch on Day 3. As time goes on, you should keep things interesting for your cat by adding new scratching posts, moving them to interesting spots around the house, and making sure that you continue to schedule play sessions daily with your cat, using new toys sometimes. If your cat has been through this 7-day training boot camp and is still scratching inappropriate surfaces in your home, consider using SoftPaws® nail caps. These are hollow, vinyl coverings for your cat's claws that protect the surfaces she scratches from damage. They are non-toxic, non-irritating, and easy to apply.